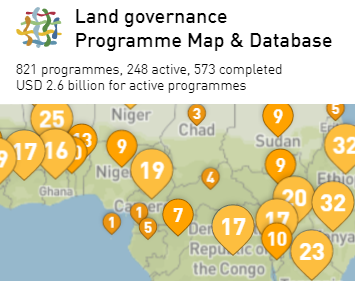 The original dataset (Land governance Programme Map & Database by Global Donor Platform For Rural Development) retains 821 projects in 144 countries with a total value of 2.6 billion dollars for active programmes and contains information the location, duration, funding and scope of each programme, as well as on the specific aspects of the Voluntary Guidelines it supports. The overall aim of the initiative is to improve donor coordination and to support implementation of the Voluntary Guidelines for the Responsible Governance of Tenure of Land, Fisheries, and Forests in the Context of National Food Security. This database and map is the result of collaborative efforts by members of the Global Donor Working Group on Land, a network of 24 bilateral and multilateral donors aiming to improve land governance and enhance transparency and coordination. It is hosted by the Global Donor Platform for Rural Development, which acts as Secretariat of the working group. Each donor is responsible for managing and updating the information contained in the database on a regular basis – the data is updated at least twice a year, around February and August. The dataset ingested on the Land Portal aggregates information at the country level (and by VGGT chapter), showing total funding and total number of both concluded and ongoing (till December 2018) programmes in each destination country. Total funding (US$) for programmes concluded in a given country. Last updated on the 31st of January, 2019. Total number of programmes concluded in a given country. Last updated on the 31st of January, 2019. Total funding (US $) for programmes still ongoing. Last updated on the 31st of January, 2019. Total number of programmes still ongoing. Last updated on the 31st of January, 2019. The Global Donor Platform for Rural Development is a network of 38 bilateral and multilateral donors, international financing institutions, intergovernmental organisations and development agencies. Members share a common vision that agriculture and rural development is central to poverty reduction, and a conviction that sustainable and efficient development requires a coordinated global approach.